iWork for iCloud isn’t the only version of Apple’s productivity suite getting attention this week. On the heels of updates to its Web-based apps, Apple has also rolled out new versions of its productivity programs for OS X and iOS, bringing with them some of the features the company promised last fall. Among the additions: Like their iCloud compatriots, the Mac and iOS versions of iWork now support sharing password-protected documents via an iCloud link. Pages users will be glad to see vertical ruler and customizable alignment guides in the 5.1 update. Numbers, meanwhile, has added sorting for multiple columns or a subset of rows. I was prepared to breathe a sigh of relief at Keynote 6.1’s addition of “enhanced presenter display options,” but I had trouble finding anything genuinely new: The update does not, sadly, appear to restore Keynote 09’s support for thoroughly customizing your presenter display. There are, however, new transitions such as Droplet and Grid, improved compatibility with Microsoft PowerPoint 2013 presentations, and the preservation of custom number formats in charts imported from Keynote 09 and PowerPoint. You can also now create charts with date, time, and duration values. 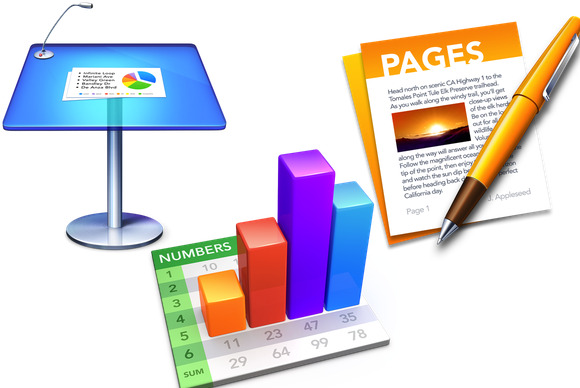 On the iOS side, Numbers 2.1 picks up the ability to both view and edit spreadsheets in landscape orientation, and Keynote not only adds new transitions to keep pace with the Mac version, but also has folded in the capabilities of the Keynote Remote app, allowing it to be used to control slideshows on other devices. If you wagered on the apps also receiving bug fixes and stability improvements, then I’m pleased to announce that you, sir or madam, are a winner. This is the second update to iWork since Apple announced its plans to restore features dropped from the rebuilt versions of its productivity apps. In November, the company released updates that returned the ability to customize iWork’s toolbars on the Mac. But Apple’s self-imposed to-do list still has a few items on it yet, so expect to see further updates as 2014 progresses.